The first service pack for Windows 7 and Windows Server 2008 R2 has been finalized and released to manufacturing (RTM). The Windows 7 SP1 RTM update package has been leaked for download. As per tradition, Microsoft has also released Windows 7 with SP1 integrated ISO image for OEM partners, MSDN and TechNet subscribers and other advanced users who need not want to install SP1 update separately after installing Windows 7. And again, the original official untouched ISO image of Windows 7 with SP1 (Service Pack 1) slipstreamed has been leaked to BitTorrent (BT) network and file sharing sites well ahead of official release. Here’s download links for various editions of Windows 7 with SP1 integrated (build version 6.1.7601.17154) in ISO image format. The ISO image is untouched, unmodified and unpatched, and can be burnt to DVD or mount onto virtual DVD drive for easy access. The checksum hashes above are identical and the same with the ISO images that are released via MSDN and TechNet Subscriber Downloads, although the file names may be different. The only difference between retail and OEM distributions is in the ei.cfg configuration file. The content of ei.cfg configuration file determines the edition and channel of distribution of Windows 7 SP1 that is going to be installed. Removing the ei.cfg file will unlock selection of all available Windows 7 editions during setup. The ei.cfg removal process can be done with ei.cfg Removal Utility to create all editions Windows 7 SP1 ISO. 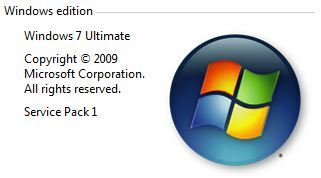 Alternatively, use Windows 7 ISO Image Edition Switcher to change edition of a Windows 7 SP1 ISO. If you need to convert and translate Windows 7 SP1 into another language, download Windows 7 SP1 language packs (MUI).